This is a case containing 24 / 50g Tubes of Happich Simichrome polish. 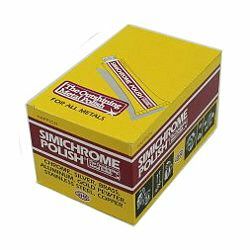 Happich Simichrome is a soft paste that cleans and polishes virtually any metal to a brilliant luster. Works well for polishing steel, chrome, aluminum, brass, gold, silver, etc. Simichrome can be used after diamond compound to bring out an ultra-fine polish while leaving a protective film. Simichrome is used extensively in cleaning and polishing plastic injection molds.